I know about loading SSI files directly and I know that the patches are obsolete now but the only reason why I used the Caribbean patch is because I couldn't make Shark's Cove load Caribbean because it expects to find vacation.grp file and not a SSI file. I didn't find any other way. EDIT: When I was writing previous post, I forgot about EDuke32 loading the SSI files, that's why I suggested the patches. My bad. Hope you will also review all the suggestions/fixes from previous page as well. Polunka, now it's your turn to report bugs as I'm taking some time off from testing the compilation pack. What I haven't fixed/changed in previous reports will remain as-is. As for any content updates, it's like I said before. 2017. At some point in 2017. Can be December 2017 even. And the Dogville readme included is from 2004, so you could have guessed from which year it was. I reported some more issues in the meantime after the 3.12 update on previous page such as the newer 2.0 version of Red Light Romp map which is available on Steam Workshop. As for those con "fixes", I did that because there are some errors. For example in Space Map Pack, one of the map's whole name is called "Beta One: Moonbase Beta" but you put just "Moonbase Beta", even though for "Beta Two", you put the whole name, which is "Beta Two: Blood Moon". For Red Series, the old Red 1 is called The Long Road, not REDDUKE. I don't know why you don't want to fix these "minor errors", I did myself and that's why I insisted on these. About content updates, I didn't know that those DM maps are classified as content updates, if you say so I will keep these suggestions for 2017 as I have a lot of suggestions regarding new content, that's why I'm saving all of these suggestions for next year. I didn't want to "spoil" anything. I'm going to remove the attachments because they are meaningless right now. As for Dogville, both the readme and the map are the old 2004 version. I have checked the map included in the pack and it's the old 2004 version. I remember the 2012 version being a lot longer than that. In the addons_readme text file, it states the years 2004/2012. I must point that the hit detection of the very first three levers of Complex (complex.grp) should be reworked, the "Mr. Zappy" one in particular requires the player to be in a position I never remember to be raised. I think this needs to be specified, it doesn't tell me anything. I never had any issues with those levels. Press Use against the wall: Not work. Crouching and look up:Not work. Press Use by a certain distance: Not work. Apparently the only "way" to turn off/on is crouch, release crouch button and press Use button at the right moment, but sometimes neither that works and not so intuitive anyway. It's clearly not intended by the mapper. That looks more like a port issue to me than anything else. I wouldn't know what makes a switch act like that. I have already seen switches act weirdly when placed on certain walls in other addons. In those cases, it only got fixed when moving the switch to a completely different wall, but that's always a bad solution. > Red Series: "RED1: RedDuke" ingame map title renamed to "The Long Road"
> Space Map Pack: "Moonbase Beta" ingame map title renamed to "Beta One: Moonbase Beta"
It is extremely likely this was the last update for this year, and probably also for the better part of 2017. My resting time starts after this update - this time for sure. Happy Holidays everybody! Thank you NightFright! You just made my day with this surprise update. Happy Holidays everyone! Caught me off guard, really! And I'm glad you've fixed the problem with MEGA. Nevermind, found it under a slightly different name. It might be a dumb question but I lost track of this for too long so ... is the fix for Oblivion's Muddlelizer integrated in this new release ? That fix is already implemented since v3.1. Or should be, at least. Yes, the fix is integrated into the newest versions. I remember I helped with fixing that bug, so I know for sure it was fixed. A new report has arrived! Credits (Robert Travis): "Moonbase Beta" -> "Beta One: Moonbase Beta"
The only thing I haven't changed myself is the FM3X description. The readme file states that the addon was first released in 2009 but Fernando actually released the New York Rebellion episode back in 2007, then he released FM2X in 2009 that contained both New York Rebellion and Orbital Oblivion. I left that for you as I don't want to change too much. EDIT: I know you said it's the last update but I had to report all of these (though I wish I found all of these before you released 3.13). Oh well, it's never too late to report any bugs. And actually I wouldn't mind a new version 3.14 (codenamed "Pi") to be released on Christmas day. No way. I am done for this year. Thank you for your report. And no more "misaligned texture" reports any more, please. Those are so incredibly trivial. Give those authors a chance for slight imperfection, ok? OK I understand. The only reason why I reported this "misaligned texture" was because it's right there at the map start. Something tells me that the author forgot to change the texture since the new version doesn't use the custom art like the first version did. "Haunted Nukem" goes in conflict with fixed GAME.CON by Darkus, not allowing it to begin (this is surely the problem because when I move it to another folder it starts). What lines I have to add to make it compatible even with that? Obviously if this does not de-fix Darkus work or negatively afflict other mods and/or vanilla game. Just wondering... is the ceiling aligned handbutton works in Mothership (part of the pipeline pack or "The Day After") now? It was a functional button in the original DOS version, but strangely not with EDuke32 versions... I'm not sure if it can be fixed with map changes or it needs change in EDuke32 code. The button opens the middle chamber of the shrink ray that allow the player to find a well hidden secret place. I remember that one of the buttons in Mothership didn't work in EDuke32 when I played the map last time in 2015 I believe. Also another important thing to mention is that the swing doors in E5L14 in Metropolitan Mayhem don't open, as said in the addons readme file. At first I didn't believe this because I remember that it worked for me before but I checked the map recently and it is indeed broken. I checked with both the addon compilation version and the normal version of Metropolitan Mayhem (the one released at Moddb) and it still doesn't work. I recall the last time it worked was in 2015 when I played the episode last time. These are definitely EDuke32 bugs that should be fixed. Now I found an old thread of mine about this issue, and the final conclusion was that v1.5 fucked it up, not EDuke32. Ceiling/floor buttons only work with hitscan or block flag on them. This addon compilation is awesome. Thanks so much for putting it together, NightFright. Also, if any mods are reading this, please sticky this thread. It's that great a thread. So it's been more than 2 months since the last update and since the thread was bumped a week ago and have recently finished with my exams, I decided that it's time to post all my bug reports, fixes I've done myself and suggestions for the next version. Warning: huge spoiler ahead! The Chronic: Typo in CHRONIC1 viewscreen "The aliens is everywhere"
BobSP Series: Added the GAME.CON file that comes with original BOBSPX map (changes protectors to spit like enforcers and queen boss drops keycard), removed the Alternate BobSP X episode. Please note that the map I kept is the "alternate" one and renamed it to BOBSPX, since THIS is the ORIGINAL version of the map. The version with missing boss fight should be labelled as "alternate", in case you want to have an alternate version of the map in the pack. For now I just kept the original version with the boss and CON file inside the fixed grp file. Operation Blitzkrieg: Renamed "BLITZKRIEG: POLYMER" episode to "POLYMER EDITION"
Space Map Pack: Earthbound: Beta Station renamed to Earthbound Preview: Beta Station (map's full name), moved Polaris Outpost 2 to the correct slot (before map "Between Sun & Moon") according to the date when was released. 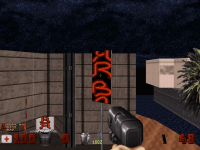 Before it was placed not only in the wrong slot (after map "Bowels of Hell Space Station", which was after first Polaris Outpost map) but also it wasn't sequel to the first Polaris Outpost map, so it should be placed in chronological order. Lorch Trilogy: (In Lorch 3) Perhaps add an atomic health spawning in front of elevator after deactivation of forcefield instead of 2 large medkits placed behind elevator? Anarchy City X: Bummed Out! Note that I don't expect NightFright to approve half of these reports and suggestions but I did my job as a bug reporter and suggestion giver. It's up to him to decide what should be approved for next version. Oh and before someone says something about all that work, no I am NOT saying NightFright should start working on these right now. He can work whenever he wants as I completely understand all the hard work that was put into this project, plus I'm not interested in gaming right now. EDIT: I have modified this post several times since I originally posted this message. I suggest to re-read all the suggestions since there are quite a few changes. Since it's part of this addon compilation, does anyone here know where the yellow key in "Alien Extermination Episode 1, Level 5 (Ambush)" is? There's no Youtube playthrough of it, so that doesn't help much, either. Woah, that's an immensely big deal of work you've done. Good job! Guess I've been absent for a little too long here (pun intended; see one of my previous posts where I addressed TheDragonLiner's absence ). The thing is, I'm not particularly interested in playing Duke 3D as of now (have been mostly into Doom/Quake 2 recently) plus NF is away (he must be busy with sth), he's not sent any posts in a while now. So I just played this level for you. I'm kinda surprised you didn't find the key. It wasn't the simplest find, but nor did it turn out so subtle. There's a room with 8 large water tanks (well, that's actually where the yellow access switch is). One of the tanks (which I marked on the automap shot in the attachment) is broken open. Just dive into it, then pass through a not-so-big underwater maze (the other tanks are involved as they're all connected into a whole system). There you will find the card next to a skeleton. P.S. : There's also a nearby scuba gear in one of the next rooms in case you didn't know. Btw, an advice: there's that file addons_hints.txt inside addons/readme directory. There you can find some useful tips on how to pass certain points in some levels of some addons.